The new collection of Grand Prix de Monaco Historique watches is composed of three instruments intended to support drivers. This complete high-performance range is composed of a chrono, an automatic model and a third with a power-reserve indicator, all dedicated to the most prestigious of the classic Grand Prix races. 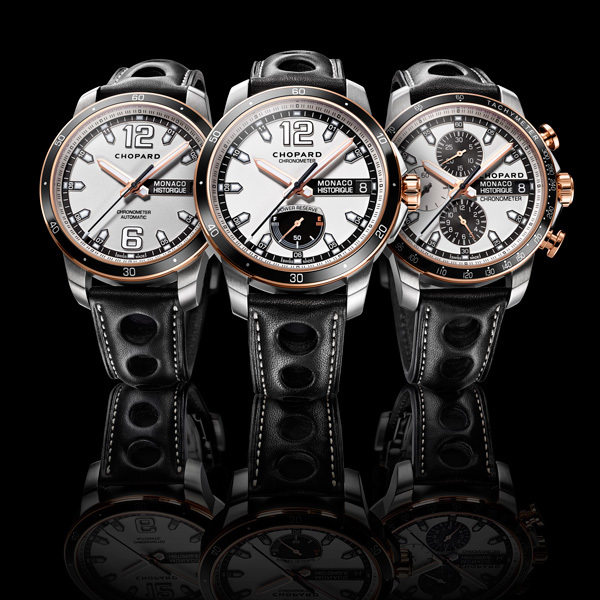 Crafted titanium, steel and rose gold versions, they all embody Chopard’s passion for racing as well as its demanding horological standards. Featuring racing cars dating from the 1920s through to 1985, the Grand Prix de Monaco Historique is by nature a multi-faceted competition that brings together a number of profoundly different machines. They all embody the mechanical excellence of their era and are driven in real-life conditions by passionately dedicated drivers. Serving as sponsor and official timekeeper of the race since 2002, Chopard is also involved for emotional reasons. Karl-Friedrich Scheufele, Chopard’s co-president, is a keen aficionado of historical cars. 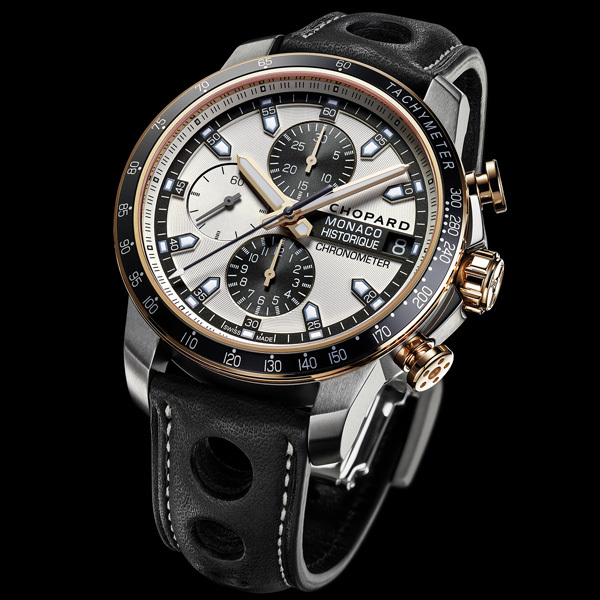 For each edition, held every two years, Chopard has thus far presented a limited-edition chronograph – the type of model typically associated with racing. In 2014 and for the very first time, Chopard is launching a full-fledged collection related to this race. The new Grand Prix de Monaco range offers a complete range of watches designed to closely match the desires of customers and drivers. Chopard thus offers three different models, each available in a dressier and more precious rose gold, titanium and steel interpretation. Equipped with various functions, the Grand Prix de Monaco Historique watches parallel the three main types of car engines: V6, V8 and V12. The Grand Prix de Monaco Historique Automatic watch is the ultimate timekeeping instrument. Its COSC-certified self-winding calibre is very much like a V6 engine. 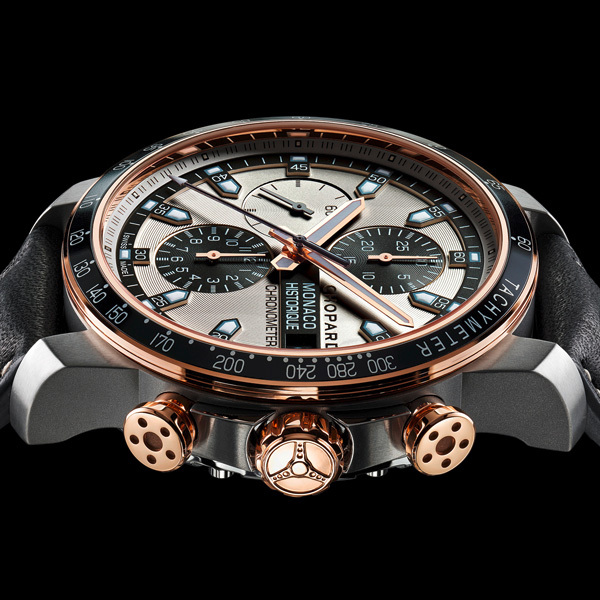 It guarantees chronometric performance to match the demands of drivers and of Chopard itself. Playing the role of a V8 engine, the Grand Prix de Monaco Historique Power Control features a power-reserve indicator placed at 6 o’clock. Its appearance is directly inspired by petrol or oil gauges. Finally, the Grand Prix de Monaco Historique Chrono is the V12 of the family. This powerful, sleek and noble instrument is the driver’s watch par excellence. The three Grand Prix de Monaco Historique models stem from a shared platform and are distinguished by an entirely reconsidered and new design. The chassis is a 44.5 mm titanium case chosen for its slightness, its hardness and its compatibility. 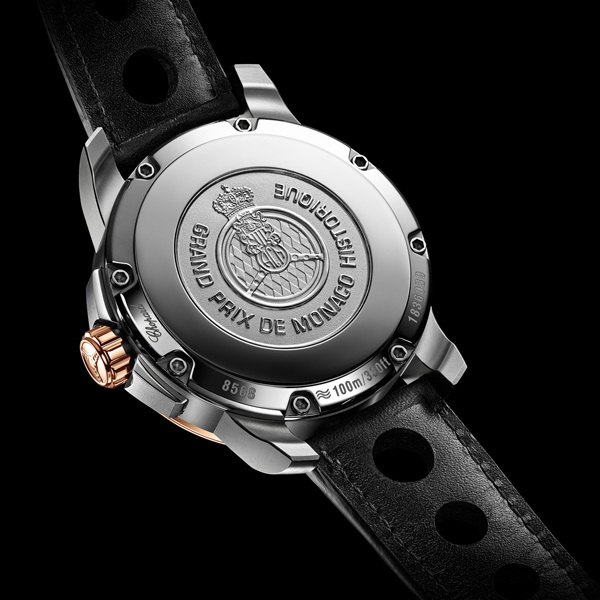 Its case-back is engraved with the Automobile Club de Monaco logo and for this reason it is made of steel which is better suited to engraving. The lugs have been redesigned to ensure enhanced comfort. But the most significant modifications relate to the dial, which features a grooved and snailed surface, thus creating an impression of constant movement reminiscent both of the sheer speed of racing cars and of chicane kerbs. 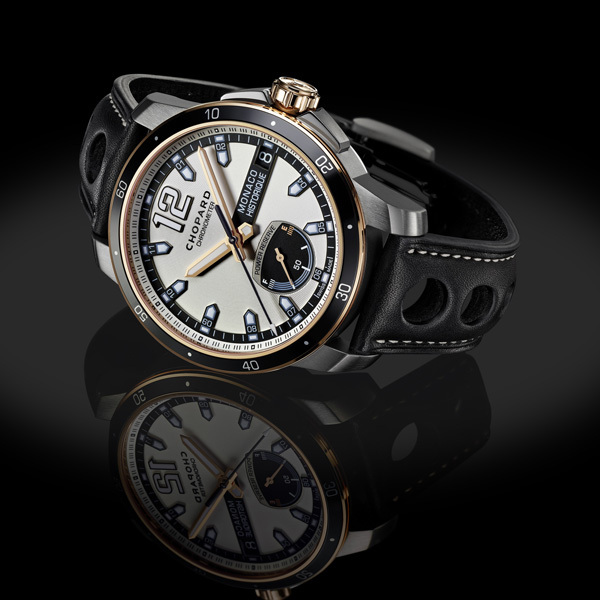 Chopard offers versions combining steel, titanium and rose gold. The warm and elegant tones of the precious metal clothe the hands, bezels and crowns of the Grand Prix de Monaco Automatic, Power Control and Chrono versions. The pushers on the latter version are also in rose gold and the same colour is picked up on the ecru topstitching of the black barenia calfskin strap. Making a striking contrast with the silver grey dials and black hour-markers, these dressier interpretations are a reminder that classic racing is very much a matter for gentlemen and thus naturally exudes an air of distinction. That is indeed exactly how Chopard sees racing: mechanical excellence, impeccable ergonomics, as well as the distinction inherent in the world of drivers.